I have always wanted to visit the holy land–a thing that so far in my life I have been unable to do. 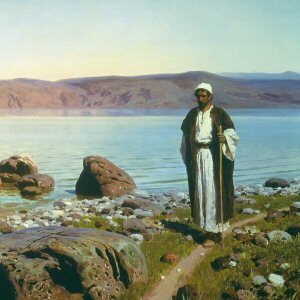 I may never see it, but as I have thought about why we call it the “holy” land, I realized that it’s because the Lord walked there. The presence of the Lord prompts us to call places “holy” or “sacred” – the lands where He lived on earth; the temple; an otherwise unremarkable grove; a garden; a tomb. The percentage of our mortal hours that we can actually spend in such places is small, but one way we can be sure of always standing in holy places is to follow in the footsteps of the Lord. When we are kind; when we serve others; when we keep our promises and covenants; when we honor our families; in short, when we do as Jesus taught, we are walking in His footsteps, and to walk in the footsteps of Christ is to stand in holy places, wherever we may be.